I have 1.7 set as target in all project preferences I've found. Also the path displayed in project SDK's under 1.7 SDK is correct path to java 1.7 installation. Even when I run java -version in terminal, it tells me I'm running on java 1.7. The error does not go away. How do I eliminate the error? Java 7 support was added at build tools 19. You can now use features like the diamond operator, multi-catch, try-with-resources, strings in switches, etc. Add the following to your build.gradle. Gradle 1.7+, Android gradle plugin 0.6.+ are required. Note, that only try with resources require minSdkVersion 19. Other features works on previous platforms. Maybe these answers above are old but with the new Android Studios 1, you do the following to see the module to run on 1.7 (or 1.6 if you prefer). Click File --> Project Structure. Select the module you want to run and then under "Source Compatibility" and "Target Compatibility", select 1.7. Click "OK". Click File->Project Structure->SDK Location->JDK Location. You could also set individual module JDK Version compatibility by going to the Module (below the SDK Location), and edit the Source Compatibility accordingly. (note, this only applies to Android Module). At current, Android doesn't support Java 7, only Java 6. New features in Java 7 such as the diamond syntax are therefore not currently supported. Finding sources to support this isn't easy, but I could find that the Dalvic engine is built upon a subset of Apache Harmony which only ever supported Java up to version 6. And if you check the system requirements for developing Android apps it also states that at least JDK 6 is needed (though this of course isn't real proof, just an indication). And this says pretty much the same as I have. If I find anything more substancial, I'll add it. Edit: It seems Java 7 support has been added since I originally wrote this answer; check the answer by Sergii Pechenizkyi. It does not affect runtime behavior, but give you latest programming features. 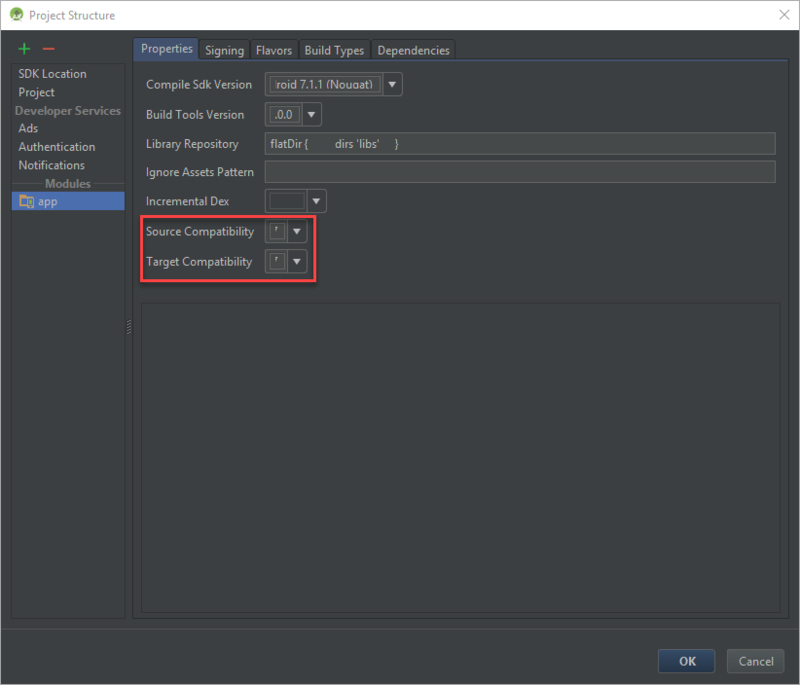 Go into your Gradle and look for sourceCompatibility and change it from 1.6 to 7. That worked for me at least. 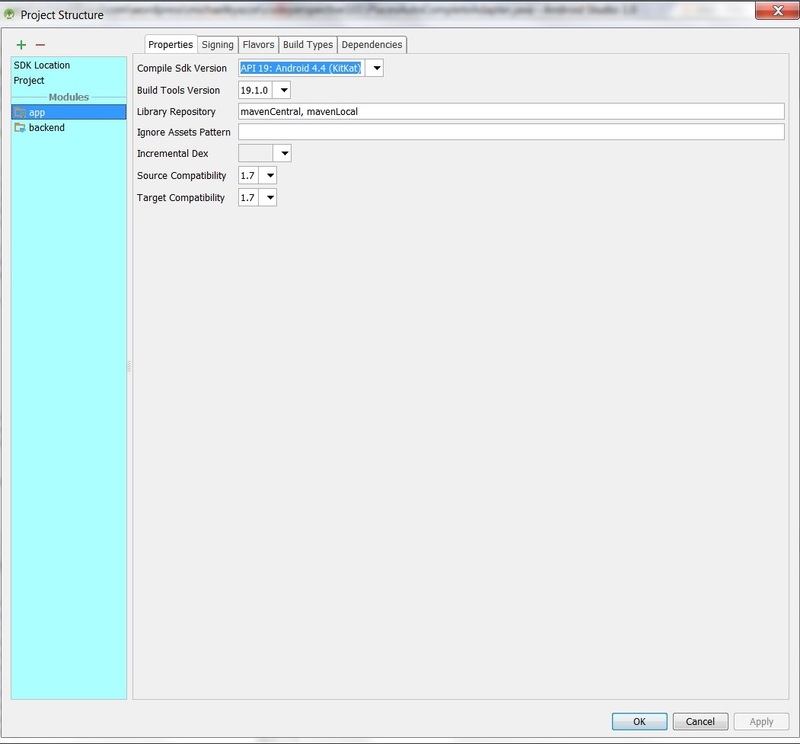 You can also go into your module settings and set the Source/Target Compatibility to 1.7. Not the answer you're looking for? Browse other questions tagged java intellij-idea gradle android-studio java-7 or ask your own question. How change language Level in Android studio? How do I tell Gradle to use specific JDK version? Android data-binding (similar to WPF)? How does Android's Java version relate to a Java SE version?